Twenty years ago today, John and I said "I do" in a beautiful church in my hometown. Just saying it makes me feel old. So does realizing that I've been married for half of my life. But I wouldn't trade one of those 7,300 days for anything. Not all of them have been good or easy or fun-filled or joyous, but they've been shared with the one I love the most in this world and that is a blessing I really don't know how to put into words. So...wanna know how we're going to spend this milestone day? John is working. I'm teaching VBS all morning, hosting a playdate this afternoon, and then we're going out for dinner out tonight with the kids! My request was that we take the kids with us. We sufficiently celebrated our anniversary last month in California, and so we want them to be a part of this 7,300th day. Because they're three of the best gifts we've ever been given. So...happy 20th anniversary, John. I love you so very much! You can get a wicked sunburn at 9500'. Wicked. I did use sunscreen, but evidently not enough. Vault toilets are totally worth driving a quarter mile up the road for. Laughing with friends around a campfire is priceless. So is watching your kids roast marshmallows and make s'mores. And homemade Rice Krispie treats will give the non-chocolate lovers their marshmallow fix. God loves my family. Proof? The Friday afternoon downpour held off until just after we got our tent put up. A vole is the same thing as a mole only it starts with a "v". Inside joke. You had to be there. A Vita-mix is the ultimate machine. And it makes some pretty tasty salsa too. 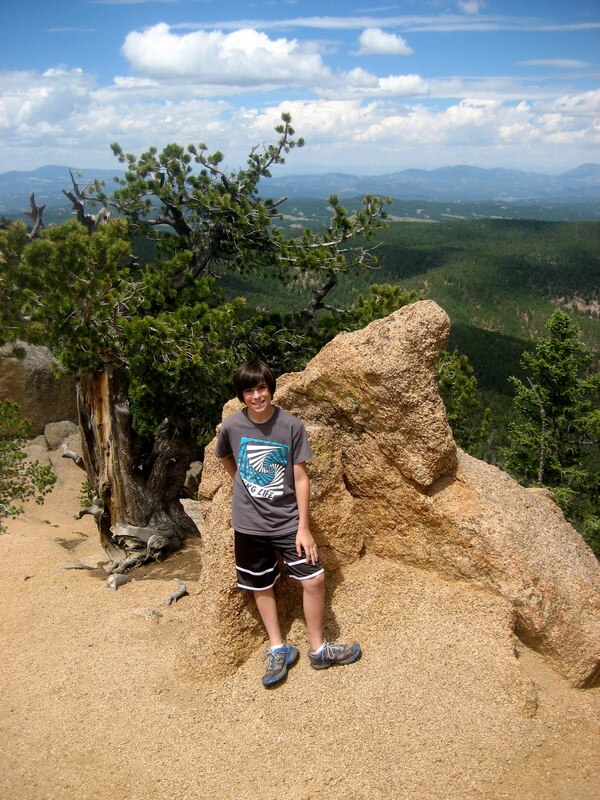 You can camp for free in Colorado's national forests. Free. I had no idea. The back of your van makes a perfectly good surface for preparing/serving food should you happen to leave your folding table at home. In the garage. Propped up right next to your van. Kids are tough. Scrapes, falls, wet, cold--they're immune to it all. A Handi-Wipe is indeed handy when you need a "flag" for a game of Capture the Flag. It's nice to have friends with a camper when it's pouring rain (again) and your tent is already packed up. It gets cold at night in Colorado. Even in June. Lows in the 40s mean sleeping in toboggans and fleece jackets. That's SNOW up above treeline! Even a really bad book will help pass time when you're the only one left at camp while your family and friends hike your favorite hike. I'm not bitter. Okay, just a tiny bit. Columbine. The state flower of Colorado. Isn't it beautiful? Knives and spoons are overrated. You can eat oatmeal and spread condiments just as easily with a fork. I thought I bought the variety pack of plastic cutlery, but I didn't. All food tastes better when you're camping. Even Folgers singles aren't half bad. According to the other four people in my tent, I snore. Loudly. Teenagers look WAY cuter in pigtails than adults do. H rocked 'em. Some people are a wealth of information. Thanks to our friend, Mike, I now know how to make my own firestarters and recycle my dryer lint. Men love to play with fire. And grill meat. And stand with their arms crossed and their legs far apart. And camping is ALWAYS more fun with good friends. ALWAYS. I'm super excited! We're loading up our cooler and a tent and some chairs and some marshmallows, Hershey bars, and graham crackers (and a whole lot more) and heading to the mountains to camp with two other families. Do you know how much I love camping? I love it. 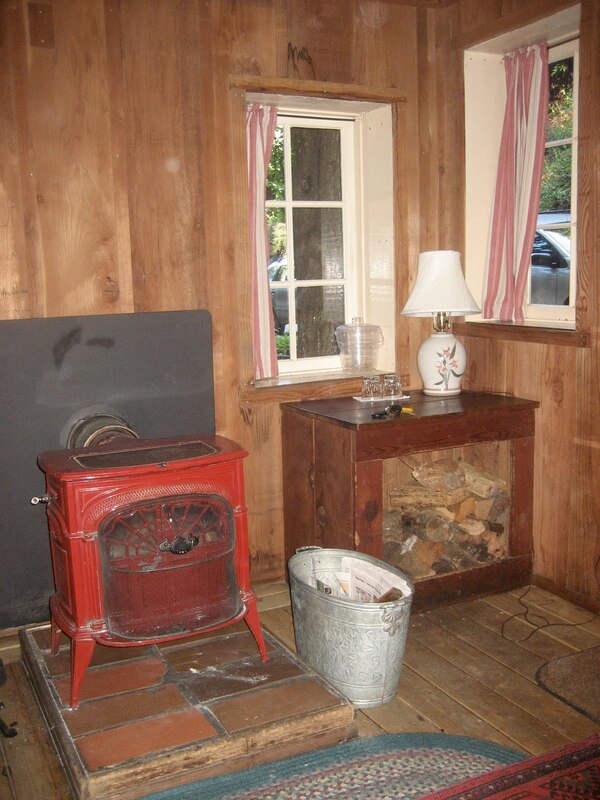 The more rustic it is, the better! I wasn't always this way. 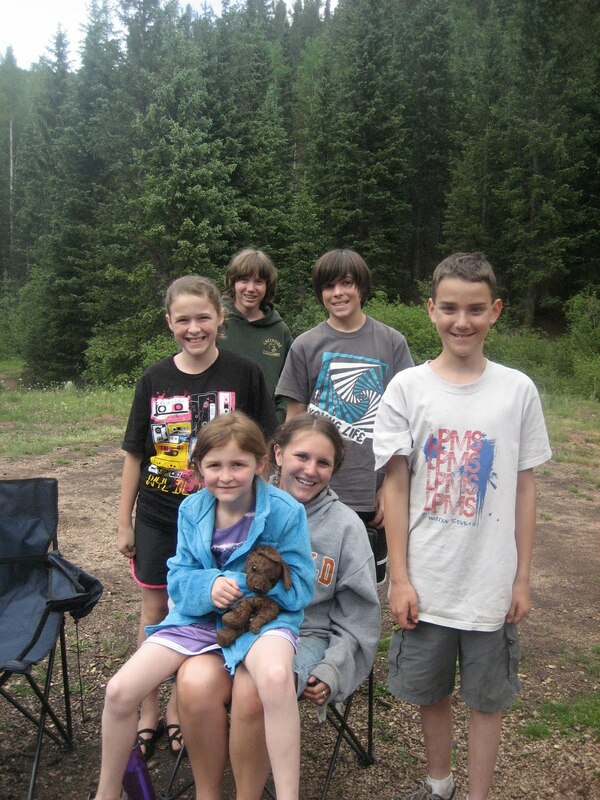 I was in Girl Scouts for ages, and every summer we sent my sister off to camp while I stayed home. Why? Because there was no place to plug my hot rollers in. And I would rather have stayed home than have had bad hair at camp. Thankfully, I've matured a bit since then. And thankfully Life is Good makes ballcaps. Camping in Colorado makes a huge difference. Arkansas is muggy and buggy and that detracts from the whole experience for me. I remember doing some camping as a kid but mostly I just remember mosquitos. There are very few mosquitos here, but we do have to worry about bears! Yikes. We're not camping long. Because VBS starts bright and early Monday morning, and also because I want to hang out with the one and only CarpoolQueen while her family is in town taking in the glory of Pikes Peak. I'll be sure to take lots of pictures. Of camping AND of CarpoolQueen. Pretty! And tasty too. John made us some for breakfast. Also wanted to share a fun 4th of July craft that the girls and I made yesterday. Sarah came home from camp with this cute necklace from the camp store. The pendant part is a guitar pick! I decided these would be super easy to make for the 4th of July using red/blue bandanas! 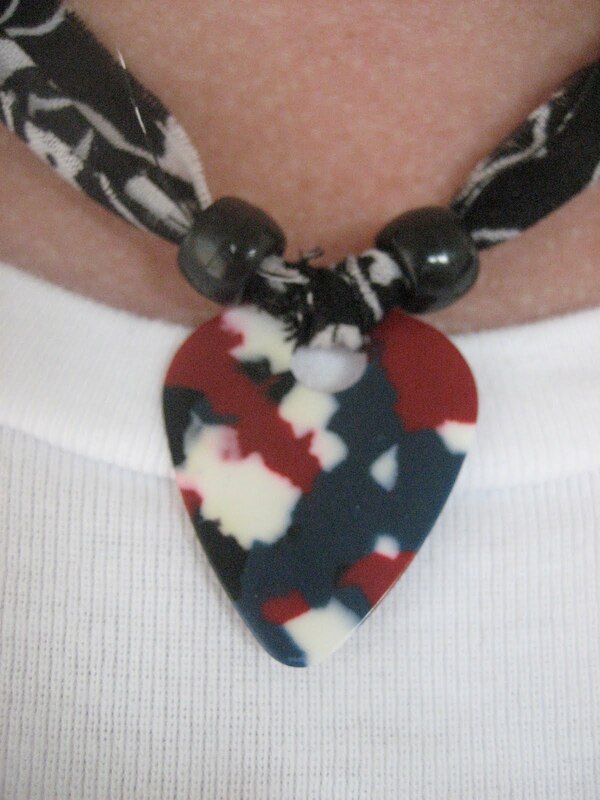 Fender makes a speckled pick that is red/white/blue/black which is PERFECT. I ordered mine here. They are 3.99/dozen with free shipping! I ordered a lot because we're going to make these as a craft at our 4th of July block party. I think they turned out really cute! I like the beads better on the one that Sarah bought but I couldn't find any of that shape at Michael's the other day. I've got to keep looking. And if anyone knows where I can find navy blue bandanas PLEASE let me know. I've tried Michael's, Hobby Lobby, Walmart and they only have royal and cornflower blue. I'm going to try Jo-Ann and Hancocks and DollarTree next week but if any of you have seen them somewhere please let me know! The black looks okay, but I think I would like navy better. It's definitely more patriotic. So...directions? You simply punch a hole in the pick with a regular ole hole punch. Thread a 1-inch strip of bandana through the hole and tie a knot. I'd either wash/dry your bandana first or dampen it before you start, otherwise it will look stiff and wide. Add a bead on either side of the knot and tie around your neck. I think you'll need the "thin" guage picks. They're very sturdy and I'm afraid you won't be able to punch through the medium ones. Depending on how many picks we have leftover, I want to make some matching earrings. How cute are these?!! Alright. I think I'll be unplugged until Monday. Peace out, peeps. Y'all enJOY the weekend. Guess what y'all? MY LEG/HIP IS BETTER! Like really, really better! Maybe it's because it's been 9 weeks since I injured it. Maybe it's because I've been resting and doing the home program that my physical therapist gave to me. Maybe it's because my PT finally hit upon something that seemed to be working (ultrasound therapy, massage, stretching, and manipulation). Or maybe it's a combination of all of those things. I just know that for almost a week I've been able to walk (mostly) pain-free and with only the slightest limp. Last week I was super discouraged after one of my appointments because what we'd tried up until that point had not shown much promise. She wanted to send me for further diagnostic testing and we both agreed to give it one more session before she wrote that recommendation to my doc. I can't tell you how grateful I was when I walked in later last week and told her that I was feeling SIGNIFICANTLY better. So much so that she dropped the further diagnostic testing talk. Yesterday she told me that maybe a couple more sessions and she can release me. I am so thankful! I still can't hike though which is killing me because we're camping this weekend at a place very close to one of my favorite hikes in the entire state of Colorado. I thought that maybe I could hike part of the way up to the summit (the very flat part) and perch myself on a rock in the water and wait for everyone else to return with their ooohs and ahhhs (and photos). I mentioned my plan to John yesterday and he said: "Absolutely not." He has allies in my therapist and the two friends whose families are camping with us. One friend told me she would "strongly discipline" me if I'm not careful this weekend. I definitely don't want any setbacks (or strong discipline) so I promised to be on my best behavior. I am so happy and thankful that this injury might possibly be behind me soon. I'm seeing the light at the end of a very long tunnel! And there is much rejoicing!!! Just a few links I wanted to share with you. Do you know what Groupon is? Is there one in your area? I missed out on some fantastic deals when I was computerless in California, but I scored a GREAT one last week. $5 for $10 worth of ice cream at Josh and John's. Check it out! I sorta think Groupon is only active in mid-to-large-sized cities though. In fact, it just got going in Colorado Springs back in early May. I wanted to try this recipe for finger paint the other day when Abbey had a friend over, but realized (too late) that I didn't have any cornstarch. Probably from all that gravy I make. Ha! Next week, I'm watching my friend's girls so I think I'll try it with them. Outside. The week that Will and Sarah were at camp, Abbey and I tried making "The Foamerator". It was cool until she took a big breath (to blow a really long foam snake) and she sucked in a mouthful of soap. She was finished after that and that's why I don't have any photos to share with you, but it was a really fun and simple activity! We're going to do it again with our neighborhood friends at our 4th of July block party! And that reminds me that I need to make a big batch of bubble juice too! Weekends. Ahhhhhhh. I just heart them. Ours was a good one. John was in New Jersey last week. ALL last week. He got home around 7pm Saturday night, just in time to have a big piece of chocolate cake that the girls baked for him. We miss him so much when he travels for work. Especially during the summer. We actually had a really good week (and I actually got more sleep than I usually do when he's gone) but we all feel out of sync when he's away. I saw a t-shirt with this "unplug" logo on it last summer in Durango and they were sold out of my size. I meant to go back and order one online but I forgot all about it until John called and mentioned that he was in the Life Is Good store getting t-shirts for the kids. I figured it was last year's design but asked him to look for it anyway. He found the mug instead and I swear that my coffee tastes even better when I drink out of it! 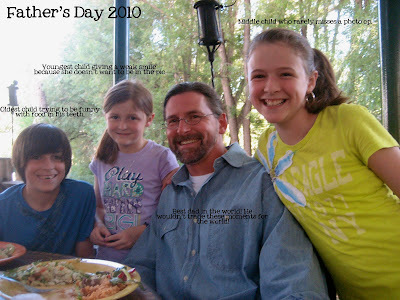 John's Father's Day request was that we take him to Amanda's Fonda for dinner on the patio. Amanda's Fonda is a great little mexican restaurant down in Old Colorado City. Their patio is awesome...it overlooks a little stream and is so shady and peaceful. We had a really nice evening and I think/hope John felt celebrated! We had such a relaxing day yesterday. It's a good thing too because this week is feeling full! 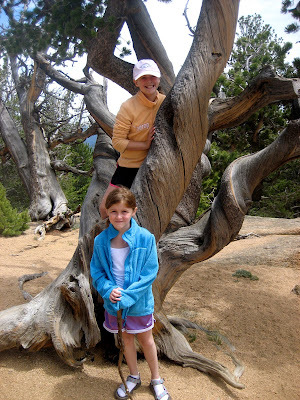 It's full of good things though--VBS prep, lots of time with friends, a girls' night out, and a family camping trip! I'm excited just thinking about it all! 1. We thought about taking the kids to New Jersey (the Jersey shore) with John last week, or in several weeks when he goes again because remember? It's Abbey's dream to go to the beach. I think we're going to pass on it though. Personally, I have no desire to go to New Jersey. 2. Can anyone recommend a good (and free) noiseware filter for photo-editing? The two pics above are in desperate need and the iphoto application didn't help quite enough. 3. Our summer really is feeling redemptive. Aside from the no-hiking-for-me mandate, we're enjoying these days so much. It's a drastic improvement over the summer of 2009. If you missed Part I, you can read it here. Several years ago I shared the amazing story of our home in Arkansas selling so quickly with a group of friends and after I'd finished, one friend asked: "Oh, do you just LOVE your home in Colorado?" And I cringed. Because honestly? No. I don't love it. Some days I struggle to even like it. Most people think that's such a weird thing to say. Some have even asked why in the world we would buy a home we didn't love. It's a fair question. After we sold our home in Arkansas, we began to quickly search for a home to buy (or rent) in Colorado. We had a nice down payment, but with houses selling for double/triple what we were used to, we were looking at a pretty large mortgage. We'd also taken a pay cut to move to Colorado. 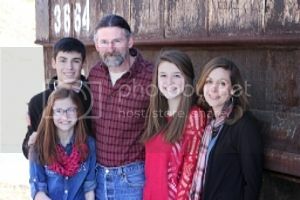 It didn't make much sense to move to a more expensive area and live on less money, but we were confident that God was in this move and that he would work out all the details. But we also knew we had to make wise decisions. We had been out here to visit a few times and had looked at few houses with a realtor. When our Arkansas house sold, we decided to make an offer on a house we had looked at and liked on our most recent visit. It had been on the market several months and so we made a reasonably low offer. That very day, another buyer made a better offer and got the contract. Our friends who lived here (the one that John was going to co-pastor with) called the next day and said that another house a few streets over in the same neighborhood had JUST been put on the market and the price was right. They asked if we wanted them to go look at it for us and we said yes. Armed with a digital camera they checked it out and reported back, and basically chose our house for us. The sellers were motivated and were willing to close quickly and so we made an offer on the house-we-now-call-home SIGHT UNSEEN. Just so you know we're not completely crazy, we made our offer contingent upon approval once we arrived in Colorado. It's a pretty unorthodox way to buy a house, and I don't really recommend it. This house was small. Very small. The bathrooms were carpeted. Carpeted. The backyard wasn't finished and needed lots of work. The basement wasn't finished either, which cut the livable space of this house in half. This house had central air conditioning! Few houses here have it, and I'm immensely grateful ours does. It was in a great school district. It had curb appeal and was in a cute neighborhood with lots of kids. And it had sidewalks. Our former neighborhood didn't and it's so much more fun for kids to ride bikes when they don't have ride in the street. We also knew that the price was right and we strongly desired to own instead of rent. Plus, the mortgage (though double the mortgage of our previous home) was going to be cheaper than most of the rentals we had looked into. Our thought was that we could live here a few years and sell it when we found a home we really loved. I suppose we could have bought a bigger, nicer house from the get-go but we would definitely have been strapped financially. Buying this house felt like a wise financial move. Little did we know that a year after moving here, John would resign from his job and our income would be drastically reduced. I cannot tell you how many times I've thanked God for leading us to a house that we could afford. If we'd chosen differently, I have no doubt that our financial state would be very, very different at this point in our lives. And also, if we'd chosen differently, I would probably be a working mom. Please don't hear me saying there's anything wrong with that. It's just not our desire for our family at this time in our lives. October will mark seven years of calling this house a home. And after seven years, I still don't love this house but I do like it a little more. But that's Part III. Finding contentment. Every time I walk in my kitchen these days a grin spreads over my face when I see this. I helped host a reception for all the confirmands at our church back in May and came home with a beautiful, leftover bunch of fresh flowers. They were so cheery that I told John I was going to add a fresh flower fund to our budget and he readily agreed. Practicality won out though. This arrangement is equally cheery and permanent. 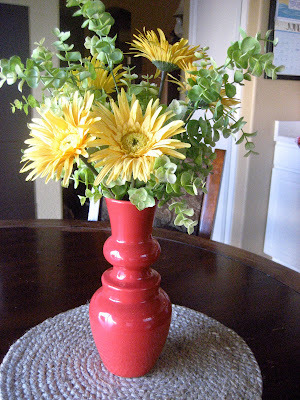 What is it about flowers and bright colors that stimulate happy feelings? Don't look too closely at this pic. I don't have spectacular skills when it comes to arranging flowers. I finally slept past 5:30AM. In fact, I've slept until almost 7AM the last two mornings. It feels decadent! We really liked The Karate Kid. I think Jaden Smith is adorable. And talented. Wow. We hope to see Toy Story 3 in the next week or two and then I think our summer movie budget will be depleted! My girls have been Crafty lately. That's crafty with a capital C. I'll post some pics soon of some of their creations. By the way, did you know that Michael's sells American Girl craft kits and supplies? They have some cute, cute stuff! I'm getting really excited about the 4th of July! It's my most favorite holiday. This year we're planning a neighborhood block party and it's going to be F-U-N! I can't remember the last time I blogged four days in a row. I guess I've been feeling rather chatty lately. I've had a post stirring about my feeling and attitudes towards our home here in Colorado for several months now and yesterday I finally sat down to try to put my thoughts down on (virtual) paper. As I was typing, I realized this is likely going to have to be a series of posts. So I want to start at the beginning. This is long, but I promise you that it's a GREAT story. 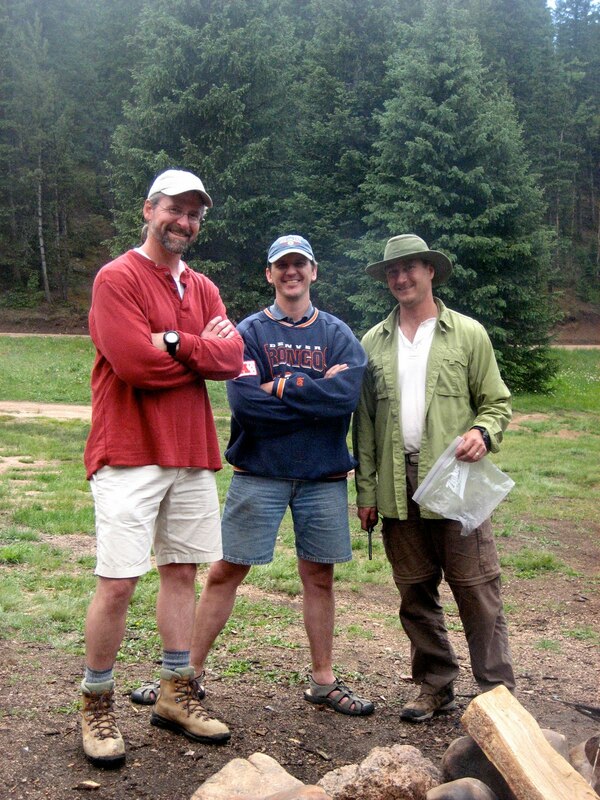 Sometime late in the summer of 2003, John and I knew we'd be moving to Colorado for him to co-pastor a church with a college/seminary friend. It was an exciting prospect on many fronts, and we both knew that God was leading us here. We had looked at houses in Colorado on one of our visits out here and were reeling from sticker shock. Home prices were double, even triple+ what we paid for our very nice home in Arkansas. We knew we'd have to sell ours before we could even consider buying a home in Colorado. The tricky part was that we couldn't put our home in Arkansas on the market until John announced his resignation from our church. And he wasn't ready to resign until about a month before our desired move day. All of that meant that the window of time we had to list/sell our home was very small. And not only did we have to sell our home in Arkansas, but we had to find one to buy in Colorado in that same time window. It's fair to say I did my share of freaking out! In that wait period, we began to get our home ready to sell. I also began to pray that God would send buyers. My specific prayer was that someone would walk up off the street, love our home and buy it. Fast forward to the Sunday that John shared with our church that our family was moving to Colorado. It was extremely emotional--the kind of day where you're just a big, blubbering, swollen mess. We loved that church and those people so much. We still do. It was a hard, hard day but it felt good to get our news out in the open and to know that we had the support of those who loved us. Whenever anyone asked me how they could pray, I asked them to pray God would sell our house quickly! Monday was another emotional day for us. John took Tuesday off and while trying to process all of our emotions, we did rote things like clean the oven and the garage with the intent of putting a For Sale by Owner sign in our front yard on Wednesday morning. Tuesday evening, John went outside to mow. He came back inside a few minutes later with a funny look on his face and said, "Mer, there are some people here who want to look at our house." Huh? What? I was in the middle of bathing three small children and hadn't cleaned up the dinner dishes and was not in a show-my-house state of mind. We asked the nice folks to give us 20 minutes and we did a whirlwind pick-up. The couple came inside, looked things over, and since it was getting dark outside they asked if they could come back the next morning. It was hard to sleep that night. Up to that point, John and I had thrown around some numbers and settled on an asking price for our home. It was a high number because we wanted to leave room to negotiate. Well, the sweet little couple came back the next morning to look at our house again. They were from New Mexico but their son and his family lived down the street from us. Their son had recently been diagnosed with MS and they wanted to move closer to his family to be a part of their support system. The town we lived in was a small one and news travels fast in small towns. They'd heard that John had resigned and although there wasn't a For Sale sign in our yard, they thought they'd walk up our sidewalk, ring the doorbell, and ask if our house was for sale. Here's where the story gets really, really good. Miraculous even. They loved our house and that very day they made us a cash offer. For our asking price. Later that afternoon we sat around our kitchen table and signed a contract with this sweet couple and because they were paying cash, we set a closing date for two weeks later. After the contract was signed, they asked if we could pray together around the table. Are you believing this? They knew all about our move to Colorado, and they were so supportive and interested in our ministry here. They were also really taken with our kids. After we signed the contract and prayed, they told us that they knew how cold it got in the winter in Colorado, and right then and there they handed us a fat check and told us that they wanted to bless our kids with really nice winter coats. Do you know anyone who has a better home-sale story than this??? It's not lost on me that God answered my VERY specific prayer. So if you ever doubt asking for specific things, let this encourage you to be bold! We went to church later that night and a sweet little old lady named Martha Lou (who I loved very much and who resides in heaven now) came and sat next to me and said, "Meredith, are you sure that it's God's will for you and Brother John (that's what they called him) to move to Colorado?" I got the biggest grin on my face and said, "Well, Miss Martha Lou, God sold our house for us today." And she nodded and said, "Who can argue with that?" The miraculous selling of our home (three days after John resigned!) was so important on so many levels. It gave us the confidence to know that God was really in this. That it was His leading. That we were on the right track. It gave our church family in Arkansas the same assurance. Our own families were sad about us moving so far away from them, but the timing and circumstances of the selling of our home bolstered their faith and confidence too. And it did the same for the church family awaiting us in Colorado. A lotta totally useless, random stuff. Is "lotta" even a word? If you were a member of SBC Arkadelphia in, say October 2002, you might be grinning right now. Becky? Are you laughing with me? Why can't I sleep past 5:30am lately? Why oh why oh why? At least I get lots of stuff accomplished while my kids are still sleeping. They're on a late-late schedule. Sleeping late in the mornings and staying up way too late at night. I like the sleeping in part, but I'd prefer an earlier bedtime. Mainly so I can have control of the television remote. One can only take so much iCarly and Wizards of Waverly Place. Is anyone else intrigued by all the college football conference shake-ups? I find it soooooooo interesting. 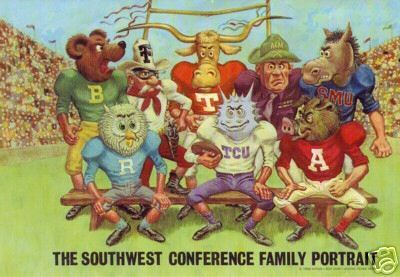 Speaking of college football conferences, does anyone else remember this picture of the old Southwest Conference from back in the day? I think the A&M Aggie and the TCU Horned Frog are hysterical. My girls spent EIGHT hours cleaning their room yesterday. EIGHT hours. It was a huge mess and I told them that I was not doing it for them this time. So they spent the majority of the day in their room coming up with reasons why the task was overwhelming for them. When they finally got serious about getting it done, it took them 35 minutes. The motivator? A trip to Coldstone for ice cream. Clearly, I'm not above bribery. I thought I had a buy one get one free coupon for Coldstone but by the time I realized that I didn't, it was too late. There was no convincing them that a one dollar cone from McDonald's was just as good. At the exact moment the Coldstone cashier was swiping my debit card, I looked over at (nameless child) who was trying hard to hold back tears as they picked up the pieces of their red-velvet-cake-with-rainbow-sprinkles-in-a-waffle-bowl off of the floor. I bit my tongue and did what any good mom would do. I bought (nameless child) another one. That ended up being one very expensive ice cream outing. And would you believe (nameless child) dropped it again inside the back door when we got home? Drama. Sarah's one regret about camp last week was that she didn't buy this bible from the camp store. I'll refrain from giving you a list of all the thing she did buy. She has several Bibles, but evidently this is the cool one to have. Since it was only $3.50 and since she's been reading and journaling every night before bed, I ordered one for her. Me: Will, do you want one of these bibles too? Will: No, mom. I already have a bible. Me: I know, I just thought you might want one like this. It's an NIV. What translation is yours? Will: (exasperated) I don't know, Mom. It's THE HOLY BIBLE!!! Isn't that all that matters? My physical therapist is sending a report to my doctor suggesting she refer me to an orthopedist for further diagnostic testing. Turns out I might not have tendinitis after all, but possibly something more serious. UGH. I'm still sad and mad and disappointed by this injury. And I still can't walk without pain. I really, really want to paint my bedroom this week. And make a shower curtain for my bathroom. I don't know if any of that will happen or not but it's on my mental "fun" list. I think I've decided to go with tile in my kitchen. I had talked myself into a mid-to-high end wood laminate but after seeing all the smudges on the samples I had in my kitchen I decided my obsessive cleaning disorder wouldn't be able to live with that. I also need something that can handle the wet snow that gets tracked in for seven months out of the year. Yes, it will be cold (all the more reason to get some UGG slippers) and yes, I'll have to be careful about dropping things on it but I think it's the most practical choice for us. Now I'm just waiting on our friend (who specializes in tile flooring) to come give me an estimate. See? I told you. A whole lotta totally useless, random schtuff. I think I'll go eat some breakfast. And get a shower. And enjoy another summer day. We're going to see The Karate Kid with some friends later. Can't wait! We're beginning our fourth week of summer and I desperately need a routine! The first week that the kids were out of school their grandparents were here and John and I were gone. The second week was spent leisurely, and since two of my kiddos were gone last week I decided it wasn't the best time to implement a new morning routine. But this week? Yep. We're getting on track. I really do believe summer should feel different than the rest of the year for my kids and I want them to enjoy it and look back on their summers with happy memories, BUT we all need a little bit of structure. Our weekend was dreary and cold. It rained the entire weekend and we even had to turn our HEAT on. Such an odd thing to do in June! It was the perfect weekend to laze around. We read books, watched movies, stayed in our pjs all day Saturday, and a couple of us repeated that pattern again on Sunday. It's nice to do that every so often but around 8:45pm last evening I started freaking out. The kids' rooms were a mess, the girls' craft project stuff was strewn all over the kitchen table, the family room was full of Barbie dolls/clothes and I was ready for them to get in bed, but I have a hard time going to bed without our house in order, especially on Sunday nights. I started barking orders and let's just say our lovely weekend didn't end on a high note. (sigh). Lazy days are great (and necessary every so often) but we need some structure too. I climbed into bed with my laptop and made everyone a chore chart for the week. Sarah and Abbey made their own a few weeks ago, but I didn't enforce it very well and they lost interest as soon as they tacked it to the fridge. This week is going to start off a little differently. They may be calling me NaziMom in an hour or two. In the past, I've let the kids make their own chore charts (with my input), or written them right on the fridge with a dry-erase marker, or even used this coded popsicle stick/jar system. I don't think I've ever generated their charts on the computer until now, but that's quite alright. It was easy-peasy. My kids usually don't balk at having to do this stuff each day. They just need the visual/written reminder. I haven't been a stickler about tv and video games this summer, but this week it all changes. They're not allowed to turn on any of their "screens" until they've each finished their basic routine. Sadly, I still have to write things like shower and brush teeth on their charts. Hope your Monday morning is off to a great, routine start! We woke up to clouds and cold again, but I think it's going to warm up a little this afternoon. I'm not complaining about the cold, but I was laughing on Saturday at all the Facebook posts begging the sun to come back out. We had record high temps last week and those same people were begging for relief. The rain that fell all weekend was GREAT for the sod that our landscaper laid last week. I'm hoping to post some pics once he finishes up back there. We're loving the transformation!!! Oh, I wanted to share one more thing that is totally unrelated to all of this talk about chore charts and the weather. I was so proud of my husband yesterday. He ran the Garden of the Gods 10-Mile Run. If you've ever been to Garden of the Gods you know it is H-I-L-L-Y. His time was awesome and he came home with this cool medal. The kids and I wanted to go cheer him on at the finish line, but I ended up letting them sleep instead because they were still exhausted from camp. Plus, it was COLD yesterday morning (temps were in the 40s all weekend!) and John got home shortly after they woke up. Super proud of him! I've mentioned a time or two that Will and Sarah were headed to summer camp this week. It was their first experience and we could not have asked for a better one. They L-O-V-E-D it. They got home yesterday afternoon and I don't think they stopped talking until bedtime. I snapped this picture before they left on Monday. I wish I had more pics from their week but (sigh) neither of them packed a camera. Sarah and Will have been a part of Wyldlife this year. 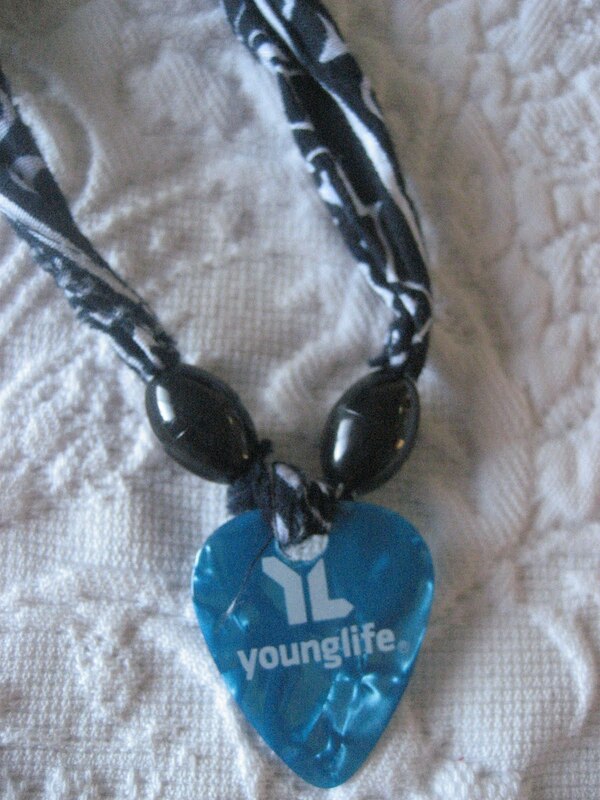 Wyldlife is the middle-school name for YoungLife--a phenomenal youth ministry. They've been on the waiting list for the junior high week at our church camp since January and when space still hadn't opened up in early May, we signed 'em up for this Wyldlife one. Can I just tell you how much it makes my heart smile to be able to see my kids get excited about this kind of stuff? And how thankful I am for a husband who works hard to be able to give our kids an experience like camp? My heart was so full yesterday afternoon listening to their excited chatter. Now we've started a savings fund for Winter Camp! Abbey thoroughly enjoyed her week as our only child. She loved having mom and dad to herself and milked the week for all it was worth. She made a list before they left of some things she wanted to do. She had a big day at Park Meadows Mall in Denver on Tuesday. She'd been two weeks before with John's parents, but this was my first time to go. It's a small store (9,000 square feet as opposed to the 60,000 square foot flagship store in Chicago) but we had FUN! That store is a little girl's dream! There is much to ooh and ahh over. This didn't happen (for a couple of reasons) but we compromised and went to see Marmaduke instead. It was a surprisingly cute movie. Abbey's favorite place to eat is Noodles & Company. Some friends took me out for my birthday one evening, so John and Abbey had a daddy-daughter date at Noodles. After dinner they went to REI to find her some summer sandals. They had a fun night and I got to hear all about it when I got home. She was pretty happy with the $2 clearance toy and the craft stuff we bought at Target, and with the toy watch from her Happy Meal. Thank goodness for that! All three of us watched Tim Burtons' version of this movie in bed one night. I fell asleep about 5 minutes into the movie, but John really liked it, and Abbey said it was strange. Everyone (excluding me) watched it again last night, and John liked it even more. I guess I'm going to have to spend part of this cold, rainy day seeing what all the fuss is about. Abbey loves to be lazy at home. Loves it. Wednesday was our designated "lazy day" and I couldn't even persuade her to go to Blockbuster and get a movie. We watched one we had at home (the original Parent Trap) and we just did a bunch of nothing. It was great! She also got to go swimming with some friends and had ice cream EVERY night. She was really in only-child heaven until it came to bedtime each evening. She's never had to fall asleep by herself since she shares a room with Sarah. That was the only hard thing. The rest of the time we were ALL happy campers. How about 10 of my favorite smells of summer? I promise this will be my last post about my undying love for summer for awhile. I apologize for the repetition. I'm just so happy about it because we were still getting snow a mere 5-6 weeks ago. I love the smell of chlorinated water. I grew up spending most of every single summer day at the pool. We were members of the Elks club and I spent a lot of time there as well as in friends' pools. One friend's pool even had a razorback painted on the bottom of it. Summer and water are inseparable in my book. Is there anything like the smell of charcoal wafting through the neighborhood at dinner time? Mmmmmmm. There is something incredibly nostalgic for me about the smell of fireworks. I just love it! Off! and Avon's Skin So Soft both make me think of summer nights spent outside in Arkansas. I don't have to use insect repellant much here in Colorado (one of the bajillion reasons I love living here!!!) but every once in a while I catch a whiff...and I like that smell and what it reminds me of. The lake definitely has a different smell than a swimming pool but I love it just as much. It reminds me of tubing and water-skiing and boating and jet-skiing and honestly, there is NOTHING that brings me quite as much summertime joy. Sad thing: recreational lakes are few and far between in Colorado. Specifically Coppertone because it reminds me of my childhood summers, but I also love Hawaiin Tropic. And Banana Boat. Does anyone still call it suntan lotion/oil? Do they even sell that anymore or is it all just "sunscreen" now? We were sitting outside at Il Vicino last weekend and it started raining. It didn't rain hard, and it didn't last long but it smelled sooooooooo good. I think summer rain smells divine. We have a honeysuckle vine in our backyard. Like most of our flowers and plants, it is just starting to green up and I cannot wait to see and smell those yellow/white blossoms. 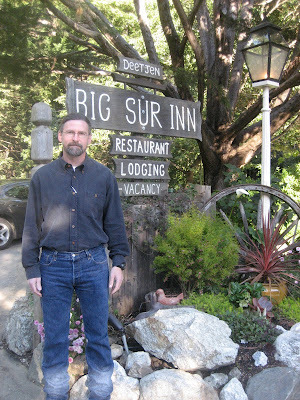 The day that John and I were leaving Big Sur, we stopped by the town's outdoor library sale. My leg was hurting pretty bad that day so I hung out for a long time by the section of books located by the honeysuckle vines and I drank deeply of their sweet, sweet smells while John perused to his heart's content. Nothing like the smell of grass is there? Whether you love it or hate it, can we agree that it just screams summer? Alright, if you want to join the 10 on the 10th this month, just make a list of 10 things--anything you choose--and link up below! I love summer. If you know me or if you've read my blog for any length of time you know that it is my absolute favorite time of the year. Last summer was not a good one. A week after school let out, my dad started having all kinds of health issues. Some were directly related to his pancreatic cancer, others were just weird and random. The days and weeks that followed were hellish. Summer failed to be a life-giving season for me and my family. Instead, it stole a lot from me. From us. It stole joy, fun, leisure, and it literally stole life. My biggest hope is that this summer will be a redemptive one for me and for my family. And if the weekend was any indication, I'd say we're on a redemptive road. Hallelujah! Friday night we had our first weekly neighborhood Happy Hour. About 20 adults and 30 kids gathered in my neighbor's front yard. The kids played and had popsicles. The parents visited while sipping cold drinks and keeping an eye on the kids. Happy Hour stretched into hours, and a great time was had by all. John and I don't really love our too-small house but we absolutely love our neighbors. We're a close bunch and are always doing fun things together. Tomorrow night the gleeks among us are getting together to watch the season finale of Glee! We enjoyed a super lazy Saturday morning. John made breakfast for everyone. Later, we did a little house work, a little yard work, and then John suggested we head to downtown Colorado Springs for some pizza at Il Vicino. It was beautiful evening so we ate outside on their patio (and evidently missed seeing some friends by mere minutes). The kids followed their pizza with some Ben & Jerry's, and when we returned home everyone (except me and my bum leg) hit the trampoline. I loved listening to my peeps play and laugh while the sun set. It was a perfect summer Saturday. John preached at our church yesterday and I thought he did a terrific job. He always does. We came home and grilled brats for lunch then he and I took a nap while the kids watched television. We helped Will and Sarah get everything packed for camp this week and then we grilled again for dinner. It was another perfect evening to dine al fresco and so we did. Eating dinner outside is one of my favorite things about summer! Don't summer Sunday evenings have such a great feel? I sure think so! This week is going to feel a little different with both Will and Sarah gone. Abbey says she's excited, and she is, but she's also a little sad too. She adores her brother and sister and they love her too. We have plenty of fun things planned for the little princess though. I hope your summer is off to a glorious start as well! I feel like I should warn you that this post is going to be long. I mentioned the other day that John and I decided there is a big difference between a trip and a vacation. For us, a trip is when you visit some place and spend your time making sure you see and do everything there is to see and do. It's not necessarily frantic, but it's not necessarily relaxing either. Usually, when we take a trip, we return home in need of a vacation. For us, a vacation is when you visit some place and you spend your time relaxing. A vacation is therapeutic to your soul. Last week we took a short vacation to Big Sur, California. Wanna know what the number one thing to do in Big Sur is? Absolutely nothing. 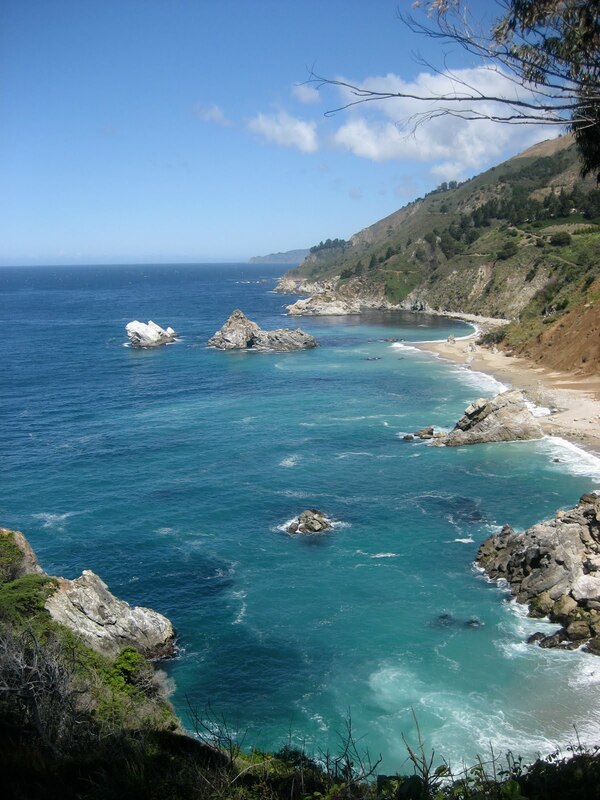 I read that before we left Colorado and I knew I was going to love Big Sur. And what's not to love? It's gorgeous. There are miles and miles of coastline like this. It is stunning. You guys know that I live in a place of spectacular beauty, but this scenic coastline took my breath away. I think the combination of mountains and sea is so unique. 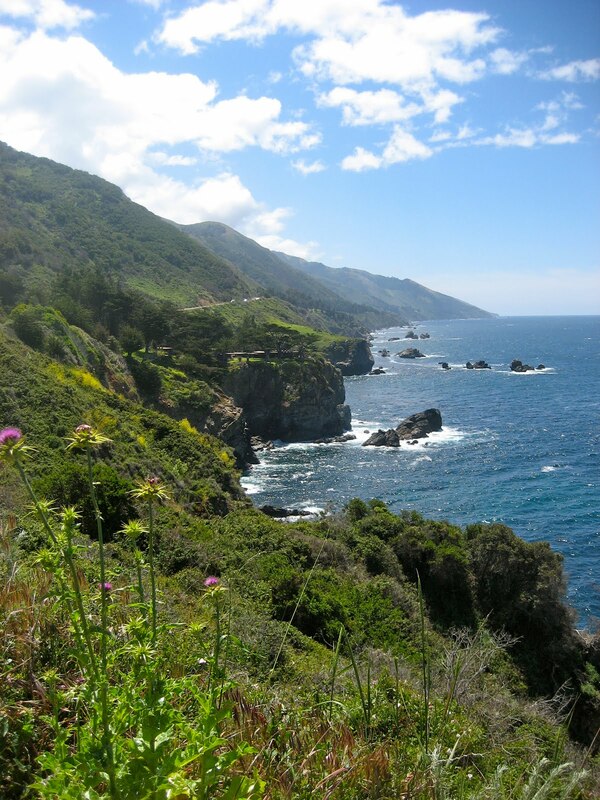 If you ever have the chance to drive this stretch of the Pacific Coast Highway, don't miss it! 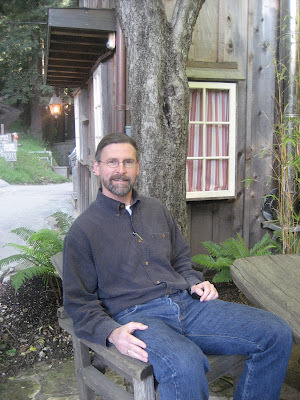 John did all the research and made all of our plans for this vacation for which I was grateful. I remember him telling me about this place called Deetjen's that he was considering for our stay. He said, "Mer, it's sorta quaint and rustic. Are you okay with that?" I like quaint. I like rustic. He chose well. We stayed in the bottom part of this cabin--in the Champagne Room. 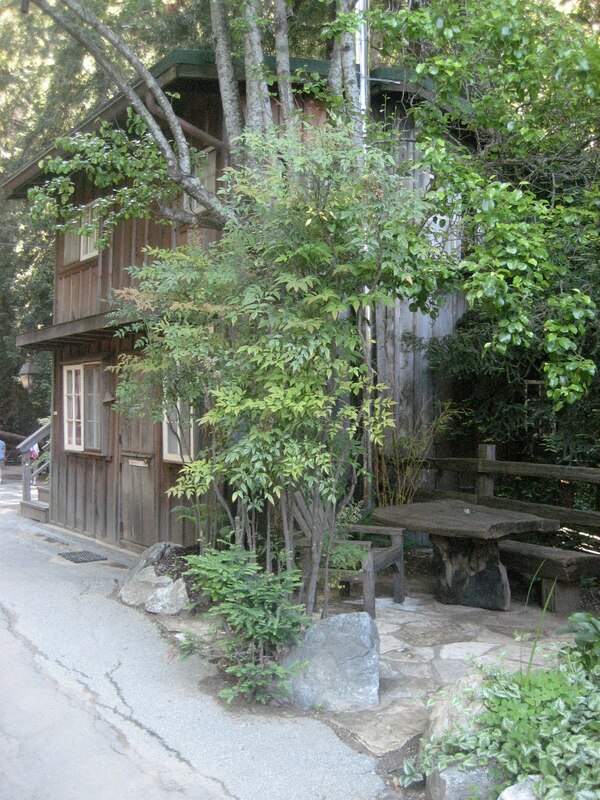 It is nestled deep in the heart of a redwood forest, and is quaint and rustic, just like John said. We loved it. Our room had a wood stove and John made a fire each evening (we needed it!) and it was cozy and romantic. This place has some rich history too, and John enjoyed reading all the old guestbooks. There were stacks and stacks of them, and I think he read every single one. Deetjen's has special, magical memories for lots and lots of folks. And now we're some of them! Deetjen's also has a wonderful restaturant. We ate breakfast there twice, and dinner there on Friday evening. Their food was delicious, and the restaurant has so much charm and character. We loved it. One funny story about the restaurant. We were eating breakfast one morning and I happened to glance up and notice Fabio, Deetjen's resident cat, outside. He walked right past the big picture window we were seated by with a mouse in his mouth. It was sorta funny. Sorta not. And thankfully I didn't lose my appetite. We spent our days doing much of nothing. Driving the coastline, finding beautiful spots to hang out and stare at the ocean, reading, napping, and of course eating! That's what you're supposed to do on vacation, right? 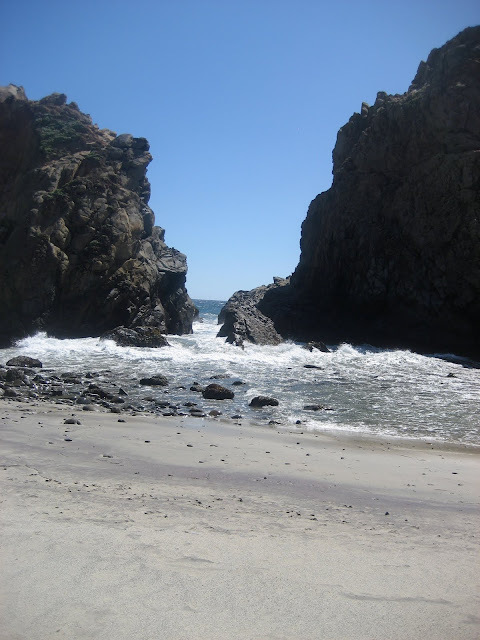 One day we found Pfeiffer Beach and walked around. And when I say we "found" the beach, we didn't just stumble upon it, we actually had to work to find it. Rumor is that every time the state of CA puts a sign directing tourists to the beach, the locals take it down. The road that leads you there snakes through some private property and I'm sure those who live along that road work hard to keep the beach a well kept secret. Ha! Once we finally got there it was FREEZING and the sand was blowing sideways which doesn't feel so good when it hits your bare skin. Needless to say we didn't stay too long. It was beautiful though. I had really hoped to see whales (humpback whales were the ones we had the best chance of seeing) but we didn't. One day we heard there was a sea otter playing in a lagoon nearby but it was raining pretty hard so we didn't walk down there. We also tried to spot some California condors. John thinks he saw some, but I think they were just big birds. Not sure... hmmmm. 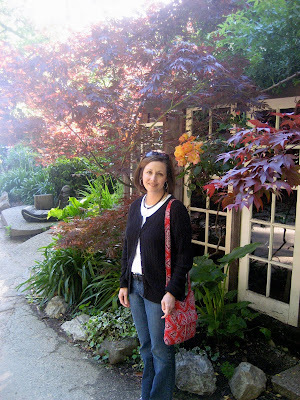 We left Big Sur on Saturday, which was my 40th birthday, and drove up to Carmel-by-the-Sea. A truly gorgeous place. We spent most of the day walking around/shopping and we hung out on the beach for awhile. Woo Pig Sooie! This Arkansas girl loved having her picture made by the razorback sign! 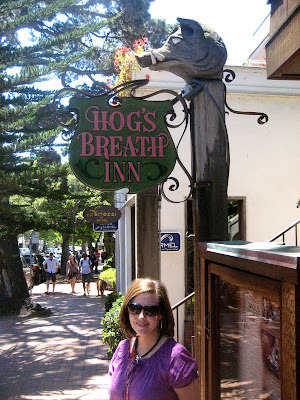 The Hog's Breath Inn is Clint Eastwood's restaurant. Oh, and we also got to eat our first In-N-Out burger. Yummmmmmm. Will was jealous. I guess we're going to have to take that boy to California sometime. I feel like I'm leaving out a ton of stuff, but this post is already too long! This trip vacation was to celebrate 20 years of marriage. Our actual anniversary is later this month but John's parents had time in May to help us with the kids so we got to celebrate early. Thanks so much Mimi and Papa for coming to stay with Will, Sarah, and Abbey. And thanks for spoiling them rotten! Happy Friday to you. I had to think for a minute about what day it was. We're on a lazy, summer schedule and I haven't been keeping track of my days very well. That makes me happy! Lists make me happy too, so I'm going with that format today. 1. I love, love, LOVE summer. 2. I'm sad for those of you who are still in school. Hang in there. Your day is coming. And hopefully it will be here sooner rather than later. 3. A lot of you have asked about my leg. It's about the same, though I have noticed significant improvement when I stay off of it. It's practically impossible to stay completely off of it, but it's entirely possible to sit for long stretches and I've been much better about that this week. Physical therapy is helping some too. I went Wednesday and she had me walk backwards on the treadmill (less pain that way) and let's just say that was interesting. I like to think I'm coordinated, but that was the weirdest feeling. I had to walk pretty slow but was thankful for a bit of cardio. 4. I took my kids swimsuit shopping the other day. Will is easy to shop for, but finding swimsuits for the girls definitely isn't high on the list of things I enjoy. I think it's hard to find modest swimsuits for girls (especially tweens) but they each found one within a few minutes of walking into the first place we stopped. I was so thankful! 5. Thanks for helping me with my "research" and giving me your input on flooring. Our kitchen is very small, so whatever we end up choosing will likely not cost a fortune. It's also likely that we're staying in this house for a while longer so I want to choose something I like/want rather than settling for something that's cheap/functional. All that to say that we're still thinking this one through. 6. Have I mentioned that I love summer? 7. I have put my kids to work this week. Sarah is handling all the laundry (thanks, Mimi!) and Will has relieved John of his dishwasher-unloading duty. Will also helped me load/unload groceries yesterday. I just need to teach someone to mop the floor and I'll be set. 8. The landscape guy started on our backyard yesterday afternoon. I cannot wait to see what kind of magic he works back there. I'll share pics of the transformation! 9. Will and Sarah leave for camp on Monday. 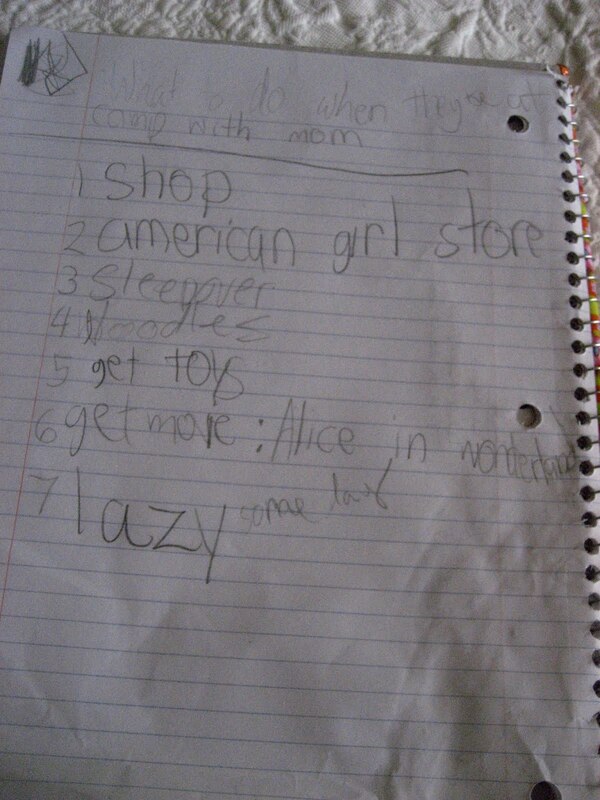 Abbey brought me a list the other night of things she wants to do as an only child. Her list includes: a trip to the American Girl store, a movie, lunch at Noodles&Co, a sleepover and being lazy at home with me. I think we can manage most of that. 10. Otter Pops. We must find some today. Two stores were out yesterday, and I don't buy generic Otter Pops. Summer just isn't summer without them. Okay, I really don't want your tired, your poor, your huddled masses yearning to breathe free. I really just want your feedback. John and I have a couple of home improvement projects slated this summer. One is to landscape our backyard (finally!) and the other is to replace the white vinyl flooring in our kitchen that I'm so tired of looking at, that never looks clean even when it is, that shows every spot and smudge and is the bane of my obsessive cleaning disorder that was original to the house. Who puts white flooring in a kitchen? John told me to do the research, figure out what I want in the kitchen, and we'll get it installed. And by installed, you should know John means he'll write the check to the floor guy. He's good at a lot of things, but he'll readily admit that home improvement projects aren't his specialty. So. I'm conducting a research experiment and would love for you to offer input on the type of flooring you have and why you love/hate it. This is not our forever house so I'm not interested in putting a ton of money into the flooring. Therefore, I'm NOT investing in hardwood. I think I've narrowed it down to laminate, tile, or vinyl. I'm open to wood laminate but wonder about Jack-the-Fat-Beagle scratching it. I also have a few friends who don't like theirs because it's hard to clean, shows dust/dirt, and can't get wet. Opinions on that? I'm open to ceramic tile but wonder how cold it will be in the winter and how hard it is to clean. Does the grout look gross after awhile? I'm open to vinyl flooring, maybe even something that looks like tile. I know it's easy to clean and as long as it isn't white I think I'd be okay with it. Opinions? I'd really love your thoughts!